I love when my mystery and chocolate worlds collide. Today I welcome Judy Clemens-Smucker aka JC Lane aka Judy Clemens. J.C. Lane is the author of the thriller Tag, You’re Dead. She also writes mysteries as Judy Clemens, including the Stella Crown series and the Grim Reaper mysteries. I am a big believer that chocolate makes people happy. It doesn’t matter the form – candy, hot cocoa, cookies, fudge -- but most of all I love a good chocolate cake…as long as it’s made from scratch. The texture, flavor, and overall taste cannot be rivaled by a boxed mix. But do not despair if you are an amateur baker, or HAVE NEVER MADE A CAKE FROM SCRATCH, you will still find this recipe do-able! There aren’t that many more steps than a boxed cake. You don’t even need an extra bowl or a mixer! Once you try this recipe, you’ll realize how fun, easy, and delicious it is to use your own ingredients and have something warm and yummy within an hour. This recipe is great for a last-minute goody to take to a potluck, give to a friend, or just devour when you need something sweet. It’s good with ice cream, a cold glass of milk, or plain and straight from the oven. So if you want to try something new, give it a whirl! I think you’ll be very satisfied with the results. Preheat oven to 350 degrees. 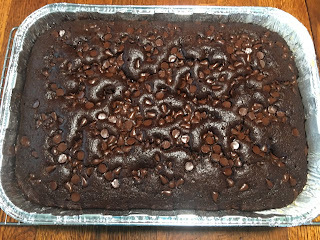 Mix flour, brown sugar, cocoa, baking soda, and salt with fork in ungreased 8- or 9-inch square pan. (I also find a pastry cutter works well.) Mix in remaining ingredients except chocolate chips. Sprinkle chocolate chips over batter. For fun, use different flavored chips on the top, such as peanut butter, mint, or various varieties of chocolate. This recipe can also be doubled – just put in a 9x13 (or larger) dish. Photo: A double recipe of the cake in a recyclable aluminum pan--on its way to a sick friend and family.